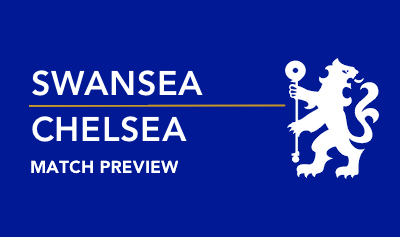 Chelsea will come up against Swansea at the Liberty Stadium on Saturday afternoon as the Premier League season approaches the business end of the campaign. The Blues are set to take a depleted squad across to Wales with numerous first-choice personnel including Diego Costa, John Terry and Eden Hazard ruled out through injury and suspension respectively. Sitting in tenth position prior to kick-off, Guus Hiddink's men could move up to eighth if they manage to bring all three points back to London and results involving Liverpool, Stoke and Southampton go their way. Francesco Guideline's Swansea team are ten points clear of the relegation zone but face a daunting run home. Following this clash against Chelsea, the Welsh outfit, 15th, will make an awkward trip to 19th-placed Newcastle next Saturday before facing Leicester, Liverpool, West Ham and Manchester City. The Swans' record in league competition at the Liberty Stadium is hardly an encouraging statistic. Beating the Londoners on Saturday would register a third-successive Premier League win on Welsh soil for Swansea – something they've failed to achieve this season. Swansea could be without Leon Britton and Jordi Amat due to injury, but Andre Ayew has recently returned to full training and should be fit to come back into the side. Hiddink has already indicated he will give a host of younger players time on the pitch in the closing stages of the season, especially considering our growing injury list. There may not be any new faces introduced for the time being, but it will be a joy to see Betrand Traore, Ruben Loftus-Cheek, Matt Miazga and Kenedy continue their run of first-team action. On a side note, the confirmed appointment of Antonio Conte is music to the ears of many Chelsea fans, but it should also serve as a warning to any member of the squad who might switch off with the prospect of silverware and European qualification now all but extinct. The Italian is renowned for his intense but fair disciplinary approach and will refuse to work with any player who's incapable of matching his desire to succeed at Chelsea. This attitude could see numerous players forced through the exit door if they continue to fail to pull their weight, irrespective of their reputation. With this in mind, many players should treat these final six games of the campaign as if they're fighting for their futures at Stamford Bridge. However, given the lack of fight some individuals have shown in key fixtures earlier in the season, it's hard to imagine those offenders will wake up at this stage. I believe we should be able to get three points against a Swansea team bereft of confidence and consistency. I'm predicting a 2-1 win for the Blues. What are your score predictions?